Sweeping – Spring brings sand and other debris to your parking lots. We use a Bobcat skid steer with a pick-up sweeper to completely clean the sand from your lot. Removing the accidental falls and wind-blown sand. This also prevents the sand from filling your catch basins. Hot Crack Filling – Asphalt will crack, this is caused from frost, drainage problems, or poor sub grade. Filling the cracks is your best prevention to keep water from getting under the pavement and weakening the sub grade. First we clean the grass and sand from the crack using high pressure air We use a rubber compound that is melted to 400 degrees F. this allows the material to penetrate the crack all the way through and completely seal it. While the material is still hot we apply Black Beauty sand to cover the material and help keep it from sticking to tire as it dries. Seal Coat – Think of seal coat as a sun block for your skin. The Sun can raise the temperature of asphalt to 140 deg. or higher. As this happens it is evaporating the oils on the surface and, over time loosening the sand and stones until the surface turns from black to gray. This weakens the surface and makes it more prone to cracks and then pot holes. Seal coat protects the surface from drying out. The dark color will make the snow melt faster and enhance the beauty of your property. 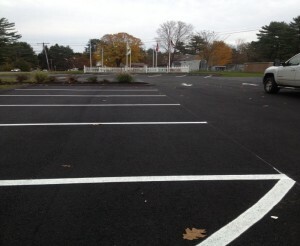 Line Striping – Business owners, your parking lot makes a first impression on a visitor or customer. Put down some bright new markings and give your complex a good first impression! Patch and Catch Basin Repairs – All parking lots and driveway will develop a pothole or sunken catch basin over time. We can repair these safety hazards.